Post accessory overhaul, I had lots of repurposing and rehoming to do. Mostly rehoming, but I had put aside a few things to frog, unweave, or refashion. I also kept finding more scarves! All were in the craft room, already awaiting refashioning or frogging. I didn’t want to add a pile of yarn to my stash. Neither did I want to turn everything into new accessories for me. I was fine with making some to give away, so that’s mostly what I set out to do. 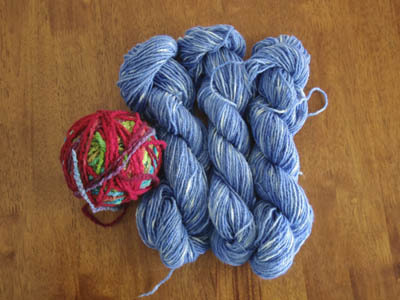 That left me with a ball of very colourful handspun and a batch of blue speckled alpaca to repurpose. The blue speckled yarn has already been knit on the circular machines several times, and is beginning to feel a bit worse for wear. Though I love the yarn, I’ve just not loved anything I’ve made from it so far. Time to try weaving it, I think. When I started entering clothing into the Stylebook app I figured I might put in scarves, gloves and beanies eventually, but I was in no rush to. When I started, I thought I’d only use the app to put together new combinations of clothing, and I figured I didn’t need any help matching accessories to outfits – they would only be an addition to any look anyway. But I didn’t know then how useful the app would be for getting an overview of what I own. Once I did well… I still put off tackling scarves, gloves and beanies. Why? Because they come with baggage. Well, to be honest, not the gloves and beanies. The scarves. Gosh, did I have a lot of scarves. Some I’d made, some were gifts and some were souvenirs. Two were given to me by a secret admirer when I was a teen (and only found out years later who sent them). Ten I’d bought on trips overseas. Nine were from my silk painting days of my twenties and, in my eyes now, are irreplaceable works of art. Ten or so I knitted or crocheted before RSI set in. Some were made from yarns spun by me and by friends. Some were made from yarn I’d bought on holidays. A few were made with luxurious, expensive yarn. A couple had been from garments I’d loved and refashioned into scarves. 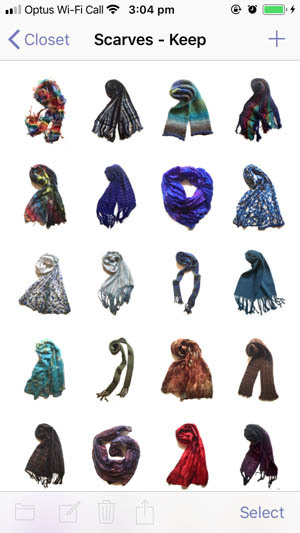 More than 80 scarves in total. How many scarves is too many? I don’t think there’s anything wrong with having lots of scarves, especially when they’re handmade or have a personal story. But I’ve had this thought, itching at the back of my mind, that I didn’t actually like quite a few of mine. So lots of quick phone snaps and some photo tweaking in Stylebook followed, then sorting them into categories. One for the artistic silk-painted ones, one for keepers, one for outs. I told myself to be ruthless but mostly I didn’t have to be. You see, I didn’t really like the scarves my mystery admirer had given to me, though I liked the guy. Some of the ones I’d bought on holidays were nasty polyester, and I have other, better souvenirs from the same trip. 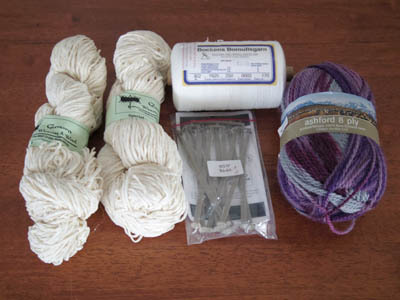 I usually buy more than one batch of yarn on a trip so I don’t need to keep all the objects made with all the yarn. The scarf made from my first ever handspun and another using a friend’s handspun could be frogged and unwoven and used again. 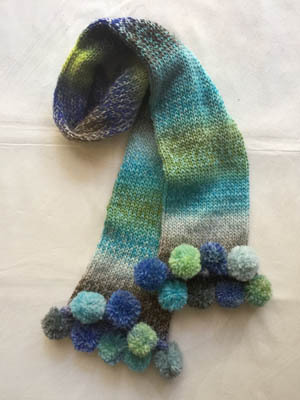 Of the scarves I’ve made… well, the rule for all handmade items applies: I tend to keep what I love, and what turns out so badly I can’t really sell or gift it. I decided the latter had to go. I got my collection down to 50 scarves, including 5 shawls. I was hoping to halve it, but didn’t really expect to get there. I could be more ruthless, but I decided to wear every scarf once this winter and see whether any aren’t comfortable or practical. I’m also thinking of framing some of the better silk-painted ones. What to do with the ‘out’ scarves? Well, I’m going to wash everything then do the usual round of clothing adoption prospects – friends, acquaintances, op shop – or else frog/unweave and make something new. Maybe even more scarves. It’s taken me months to sew this up. I’d do a seam, find a mistake, unpick it, sew it again, find a mistake, unpick it, sew it again, spend the next few days with a sore back, forget the jacket exists, remember it exists but don’t want to stuff up my back again, finally get the courage up again to work on it and… repeat. But it couldn’t last forever, and last Friday I finally finished. Yarn: Bendigo Woollen Mills 8ply Cotton in pomegranate… and a darker, purpler shade of the same yarn from a very different dye lot. 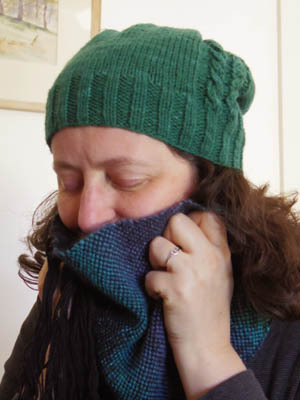 Pattern: Seaview, with a plain collar and a garter stitch row added to the cuffs and hem. Notes: If I made this again I’d do the body in one piece. I like the structural support side seams give, but the fronts are pretty narrow so I could have relied on just the collar seam for that. It’s very comfy. I think I’d like some sort of closure. There’s a small safety pin holding the fronts together in the photo. It pilled like crazy under the arms the first time I wore it. I hope that isn’t going to be an issue. It’s made me reconsider my idea of finishing off the rest of the Bendigo Cotton on the machine. The new ball was noticeably lower in quality to the old, with some very thin spots in the yarn in a few places. I’ll be watching for holes. Well, if I do machine knit some more summer clothing, it’ll have to wait a while. We have some guests staying soon so will need the dining table clear for a while. During a recent trip to the dentist for a checkup and clean I was listening to a happy commentary about how great my teeth were when there was a pause, and then the apologetic news that a filling had fallen out and I needed a replacement. Yeah, well, stuff happens, and often seems to happen in clusters. I’d rather have a filling than back surgery, though there have definitely been times at the dentist when I wished for a general anaesthetic. 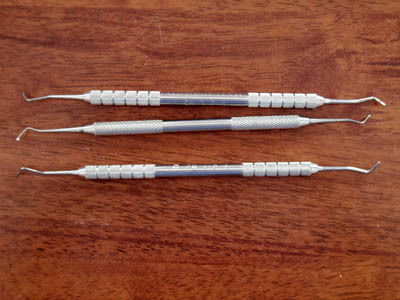 I’d noticed that the dentist’s tools came wrapped in plastic, so I asked if they threw them away at the end of each day. No, thankfully they are sterilised then repackaged. Later I asked if he had one past its use-by and would be thrown out, as they are very handy for manipulating stitches on a knitting machine. He popped out of the room and came back with three. So that weekend I gave them a try on the Addi Express. Oh, so much easier than the little plastic needle supplied! 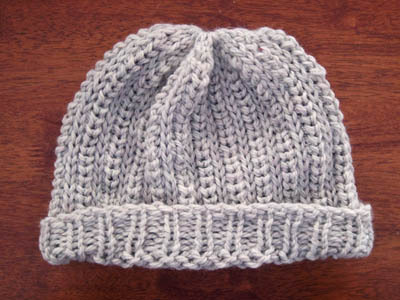 I cranked out the above hat using tuck stitches – which is a simple technique where you make the machine skip a stitch. 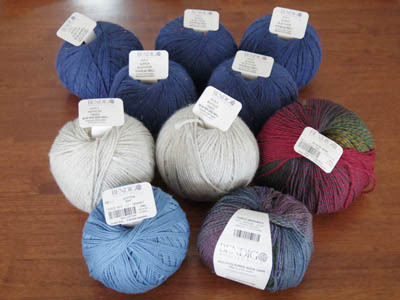 The yarn is something I picked up at Bendigo Woollen Mills. It’s labelled as ’16 ply recycled yarn’. Which is about as thick as I’d go for these machines. It makes a nice, cushy hat. But it definitely is too warm for hats here now! Some time ago I tried cranking the base for the Latu hat on the larger circular knitting machine with the intention of dropping and latching up the rib and cables. But the gauge was way off and I ended up slowly knitting it by hand. 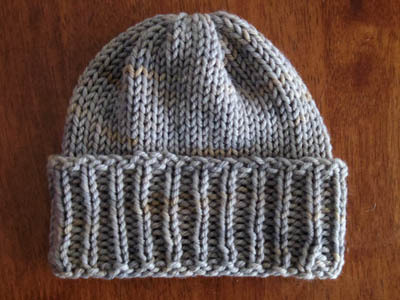 Most of my knitted hats are fitted. The slouchy volume of this design appealed to me. I can pull it down over my ears if I want to. Of course, it’s now getting a bit on the warm side for hats. My Stylebooking continues. Yes, it has become a verb. I’ve added bags and jackets and travel clothes and summer hats and belts. I’ve culled a piece or two almost every time I added a category, but not a lot. Except for the belts. I had heaps of belts. I don’t wear belts so why the heck did I have so many? Most of those went the op shop. I got rid of a black bag that I bought because it has all the pockets and handles I like and was the right size… but I finally admitted to myself that I hated it. So. Ugly. I found one I liked on the way out of the op shop. Bag in, bag out. I never used it. I took it apart and sewed the ends together. Ta-dah! Cowl. Which happens to go nicely with the gardening hat. It’s not been all about the culling and refashioning, though. When I added my jackets to Stylebook I realised I wasn’t using my denim jacket, even though I like it. Why not? Well, it turns out I’m deathly afraid of double-deniming. So I used the ‘looks’ feature of the app to come up with outfits that I could wear the jacket with. And then I wore one. Win. All this has been a welcome distraction whenever I have a few minutes free. I’m back working on the book. Paul has had back surgery. I’m going to have my first tooth filling in years on Monday. The weeds are going nuts. I haven’t done much weaving in ages. 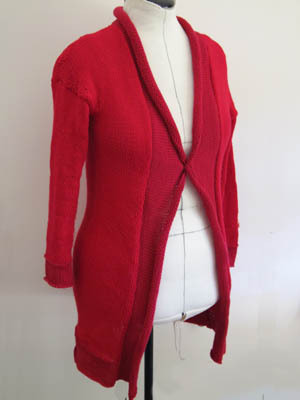 I haven’t even finished sewing up the red cardigan. I’ve run out of energy and inspiration, just getting through each week. But we’re not unhappy. Just exhausted. 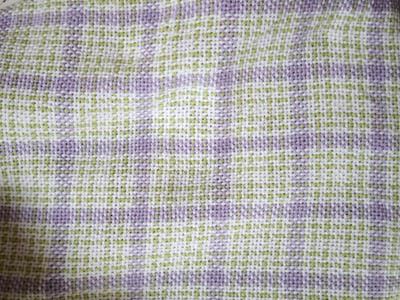 I’ve woven baby blankets out of Bendigo 8ply Cotton a couple of times before. 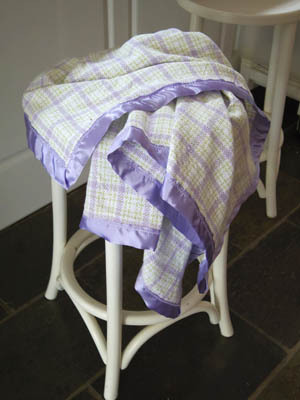 It makes for a cushy fabric, once it’s been washed. Someone told me ages ago that baby blankets are generally a meter by a meter, so that’s what I aimed for. I do like using the full width of the loom, or close to it. 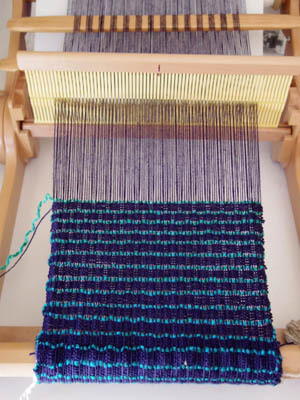 As it turned out, I wound up with 400 warp ends, and I have 200 heddles on each shaft, so I didn’t need to move any heddles. Bonus! Partway through measuring the warp, I began to suspect I wouldn’t have enough of the green. I did some maths and found I’d be just short, so I had to buy more of it. Fortunately the colour is still available. I bought another ball of white, too, just to sure. So my stash won’t be reducing in size as much as I hoped by doing this project. 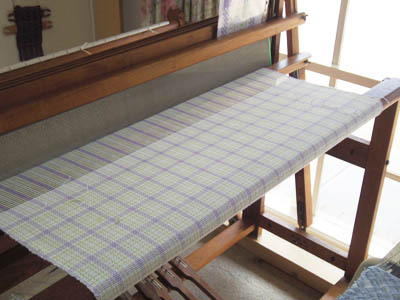 Once the warp was on the loom I realised that I had a problem. The standard boat shuttles won’t hold much of the 8ply yarn. My longest stick shuttle isn’t far off the width of the blanket, but I have no space to the right of the loom to get it into the shed. And I only have one of them anyway. Thankfully I found some large boat shuttles at the Bendigo show. I bought two, which was silly since I’m using three colours and I’d probably use these for krokbragd, which uses three shuttles. 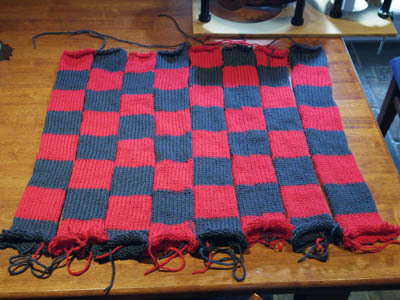 I was hoping to be able to simply seam the two ends of the blanket, but carrying the yarn up the sides didn’t make for a very tidy edge. I wound up sewing on blanket binding. Not my favourite task! But it turned out better this time than the last. The draft is something I spotted in a photo and worked out on a draft-making app on my iPad. While I like the result I wasn’t as thrilled with it in person as I thought I’d be. Still, it is pretty. The whole project has me thinking that maybe I’ll use the rest of this yarn on the knitting machine. It’s not that I don’t enjoy weaving baby blankets, but my friends are all past the age of having babies and while I enjoy the weaving I really dislike the sewing part. And playing with the Addis and Bond has reignited my interest in machine knitting, which is something I’d like to embrace while it lasts. To quickly make more room in the stash for Bendy Show purchases, I decided to knit up the last of the bargain yarn from the Lincraft sale. It’s a non-machine washable yarn that I suspect is meant to be fulled. It was a delight to work with on the machine. Together, the colours reminded me of a chess/chequers board. 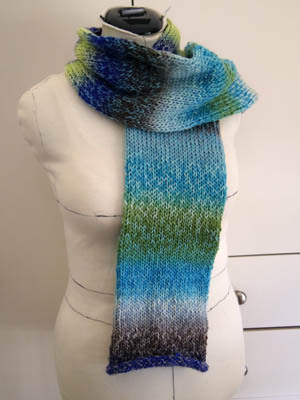 That gave me the idea to knit tubes in stripes that would form squares. I did a test swatch, then got cranking. Then I bound off the end of the tubes and sewed them together. 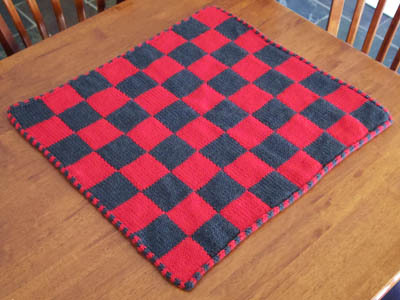 Crochet turned the straight edge of the outer squares into a jagged one, so I rejected that. Applied i-cord worked better. However, though I’d spliced all the remaining yarn of the two colours together, by the time I’d done half the edging I knew I didn’t quite have enough. I went to the Lincraft site to see if I could buy more. Yes, I could, but only buying two balls of the yarn made the postage uneconomical. So I started looking for some haberdashery I needed. I found that their range online is very small, and none of the things I wanted were there. So I cancelled my order and decided to rethink the edging. Alternating stripes of red and grey was the answer. That got me around the rug and used up most of the rest of the yarn. 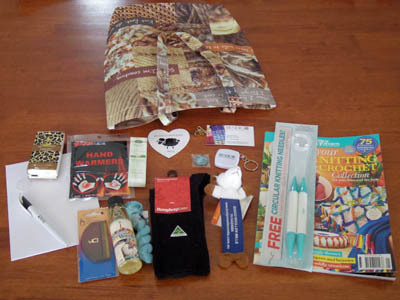 There are still five Lincraft stores in Melbourne, but none particularly close by. 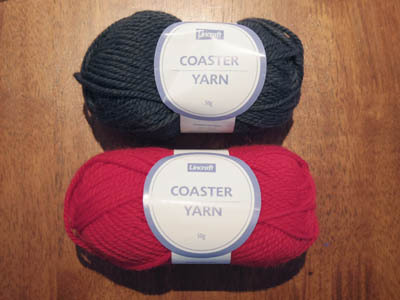 Their yarn isn’t available anywhere else, online or not, so I don’t think I’ll be buying any more. I like to know I can pick up another ball if I run out without paying more again than what it cost in postage. It’s been two years since I last went to the Australian Sheep & Wool Show, and on that visit I bought mainly fibre for spinning. I more than made up for it this year. Last time I went alone, but this time I had the company of a friend – and ran into another on the way home. 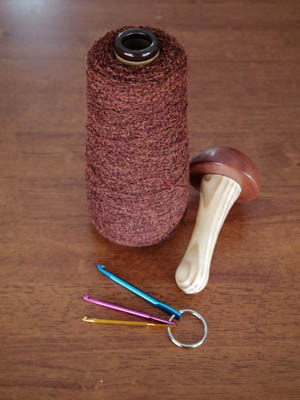 Both of them are knitters, and one is also a spinner and weaver. 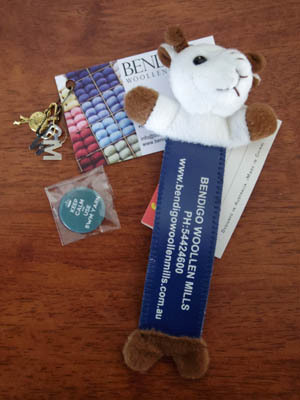 I had quite a to-do list, from visiting a seller of looms to approaching a publisher of books about an idea I’ve had for a while, eating the same scrumptious lamb rolls I had the last two times and visiting Bendigo Woollen Mill. Plus a sachet of hot chocolate (drunk), a pack of mints (forgot were in my bag), a bottle of water and a calico bag (given to my companion in yarn covetousness). That’s a bookmark, badge and stitch markers. If anyone (within Australia) wants them leave a comment and I’ll post them to you. The blue is ‘8ply alpaca blue fleck’ had been brought into the back room just that morning. The grey is ’16 ply recycled fibres’ and is lovely and soft. There’s a ball of Bloom in ‘wine’ colourway and multicoloured sock yarn in ‘purple green multi’. And the only yarn from the front room is a ball of 10ply cotton in ‘sky’, which I want to try machine knitting. We headed to the show next, had lunch and made our way back through the sheds. I found the Louet dealer, who didn’t have floor looms as I’d hoped, but we talked about me going up to her workshop in Sydney later in the year. 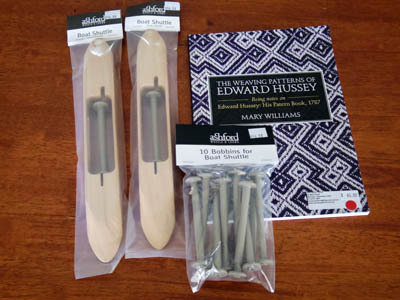 I spent some time at the Ashford stand and bought two large shuttles and bobbins – just in time for the blanket I just finished warping up – and a book of weaving patterns from an old manuscript. At Glenora’s stand I bought some more 8/2 cotton and chenille, a ball of Ashford 8ply and a part for the Knitters Loom that broke a few months back that I didn’t know you could buy. 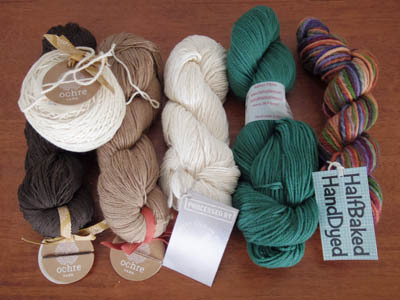 And I had mentally decided I wanted to buy a handful of single skeins of pretty or luxurious or interesting yarn. 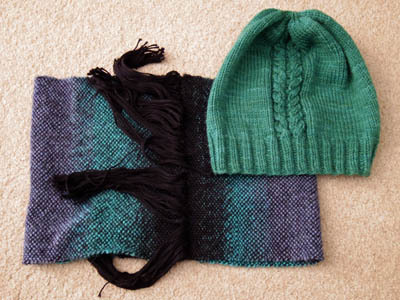 From left to right: yak (white and chocolate) and camel (brown) yarn from Ochre Yarn, Australian grown and processed cotton (the first in recent times) by the Great Ocean Road Woollen Mill, a lovely soft green yarn for a hat that matches my Green Stripes Jacket by Kathy’s Fibres, and a multicolour yarn that caught by eye by HalfBaked HandDyed. When I first visited the show in 2007 I took photos, watched demonstrations, looked at all the animals and watched sheepdog trials. In following years I added the fashion show to that list, but as the show grew in size I didn’t have as much time for looking at animals and trials. Now I’m pretty much down to lunch and shopping. I didn’t bother with the fashion show this year now that it doesn’t include handmade items. Today I’m exhausted. 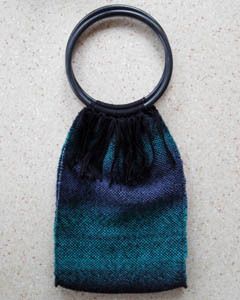 I expected that and planned to do not much more than write a blog post, add my purchases to the stash spreadsheet then put them away, and maybe do some weaving. 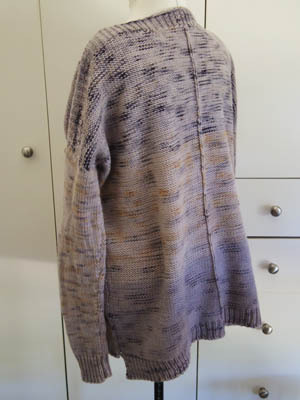 Back in 2010 I bought one and a half kilos of Ton of Wool cormo yarn, inspired by the locally-grown and made philosophy. RSI stopped me knitting in 2011. For a while I intended to weave the yarn, but I didn’t want anything white. Dyeing would fix that but it was expensive yarn and I’d read that it was hard to dye. Wait long enough, and I stop being precious. I’ve already posted about the dyeing. The result certainly wasn’t consistent. But in the intervening years I’ve grown to love the look of natural dyed garments, with all their organic beauty, so I didn’t mind. The colours remind me of the sky when you look the opposite direction to the setting sun. Purples and a touch of orange. 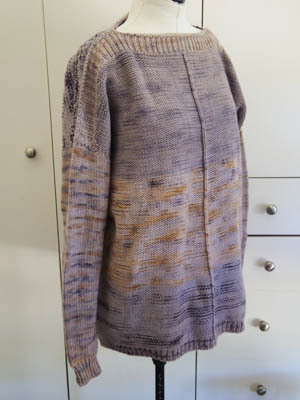 So I’m calling the garment Dusk. 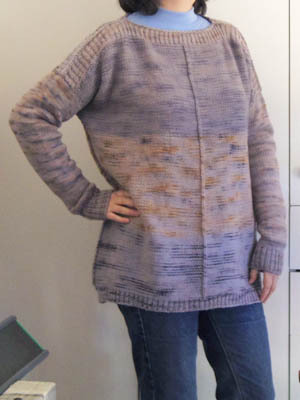 The pattern I used is “The Weekender” by Andrea Mowry. Modified to knit on the MegaBond. It was an easy conversion of a fairly simple pattern. Much faster than the Green stripes Jacket. Is there a trend for boxy oversized jumpers with skinny arms? If there is, then Dusk it rocking it. Not that I care much about being trendy. I wanted a warm, cosy jumper and that’s what I got. So one of the batches of yarn I decided to knit up straight away to make room in the stash contained two balls of California 8ply in the ‘lagoon’ colourway. I started cranking thinking I’d see how the colourway played out then separate it into sections to make hats out of. But once it was off the machine it said ‘scarf’ to me. The way the ends curled up appealed, so I simply did a stitched stretchy bind off. 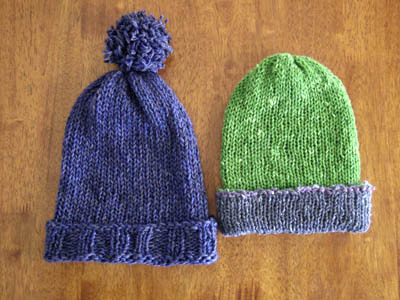 The idea of attaching little pom poms around the ends also appeals, but I used up all the yarn. Maybe I’ll find a skein at the Bendy Show.